As the Rock Against the TPP tour continues its way around the country, word is spreading that it's not too late for us to stop the undemocratic Trans-Pacific Partnership (TPP) in its tracks. The tour kicked off in Denver on July 23 with a line-up that included Tom Morello, Evangeline Lilly, and Anti-Flag, before hitting San Diego the following week where Jolie Holland headlined. You can check out the powerful vibe of the kick-off show below. And the tour isn't even half done yet! This weekend, Rock Against the TPP heads to Seattle on August 19 and Portland on August 20, featuring a number of new artists including Danbert Nobacon of Chumbawamba in Seattle, and hip-hop star Talib Kweli in Portland. The latest tour date to be announced is a stop in EFF's home city of San Francisco on September 9, featuring punk legend Jello Biafra. Doubling down on U.S. law that makes it easy for copyright owners to have content removed from the Internet without a court order, and hard for users whose content is wrongly removed. Forcing six other countries to go along with our ridiculously long copyright term—life of the author plus another 70 years—which stops artists and fans from using music and art from a century ago. Imposing prison terms for those who disclose corporate secrets, break copyright locks, or share files, even if they are journalists, whistleblowers, or security researchers, and even if they're not making any money from it. In addition, the TPP completely misses the opportunity to include meaningful protections for users. It fails to require other countries to adopt an equivalent to the fair use right in U.S. copyright law, it includes only weak and unenforceable language about the importance of a free and open Internet and net neutrality, and its provisions on encryption technology and software source code fail to offer any protection against crypto backdoors. 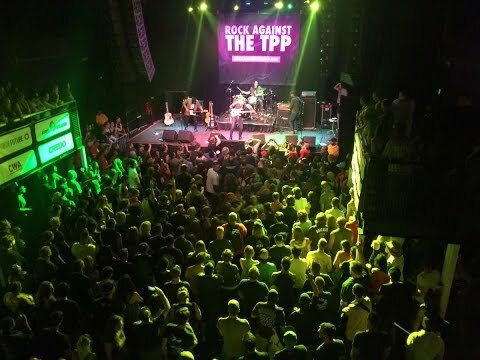 Rock Against the TPP is an opportunity to spread the word about these problems and to stand up to the corporate lobbyists and their captive trade negotiators who have spent years pushing the TPP against the people's will. First and foremost it's also a celebration of the creativity, passion, and energy of the artists and fans who are going to help to stop this flawed agreement. If you can make it to Portland, Seattle, or San Francisco, please join us! Did we mention that the concerts are absolutely free? Reserve your tickets now, and spread the word to all your family and friends. With your help, the TPP will soon be nothing but a footnote in history.